Cancun Hotel Map – the interactive map showing travelers where all the hotels, restaurants and attractions are located. 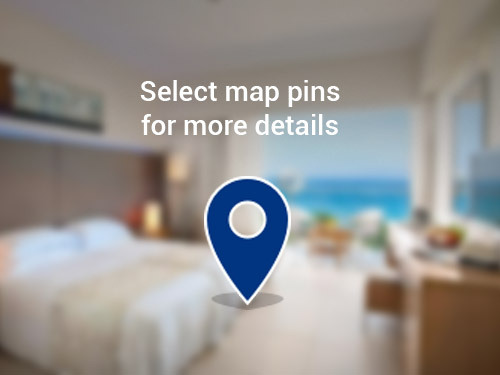 Click the pins on the map to see details about the hotels on Cancun Zona Hotelera Map or restaurants. You can filter the map results by All Inclusive Resorts in Cancun, Adults Only Resorts in Cancun, top hotels, mid-range hotels or budget hotels. For dining you can see map of Seafood Restaurants in Cancun, map of Mexican Restaurants in Cancun, map of Steakhouse Restaurants in Cancun, map of Italian Restaurants in Cancun, map of Cafe Restaurants in Cancun, map of Pizza Restaurants in Cancun or map of Japanese restaurants in Cancun. We are using Google Maps for an interactive Cancun hotel map, and you can find all the hotels from the Blvd Kukulkan from Cancun, Mexico.